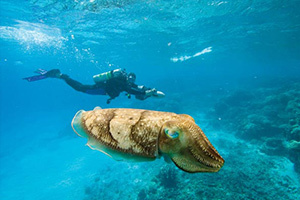 Have you always wanted to try scuba diving? Now is the time! Our instructors and guides are some of the finest and have the experience and skills to take your scuba diving to new levels. Whether you're a beginner or experienced diver, we offer lots of new and interesting ways to visit the underwater world. Once you know how to dive, you'll never be happy on dry land again! 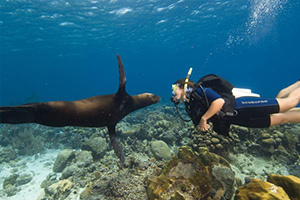 All our scuba diving courses and certifications are PADI certified. The most recognized dive training organization in the world. 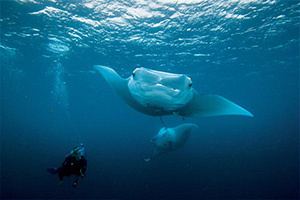 As a PADI certified diver your allowed to dive all over the world. 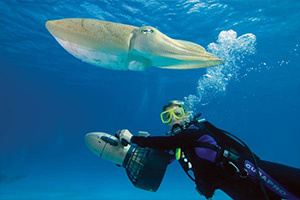 Contact us today to start your Underwater Adventure. If you are short on time or you just want to check out what all the fuss is about then this is the option for you. In the time it takes you to start to feel comfortable with your scuba equipment we'll have the fishies eating out of the palms of your hands in your first exploration of the underwater world! When you try diving for the first time, you discover the excitement and mystery & the freedom and serenity. Nothing compares to the "weightless" exhilaration of flying underwater and only a diver knows that feeling. 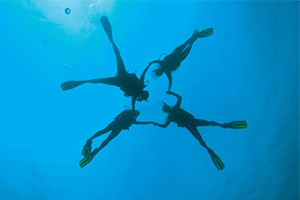 Discover Scuba Diving & feel it for yourself. If you haven't been diving for a while and your dive skills aren't as good as they should be we strongly recommend that you do a Refresher Course before you go diving again. A Refresher Course will make you feel much more comfortable when you get back in to the water. We will get your dive skills back to where they should be. With one of our experienced instructors you will spend approximately 1 - 1.5 hours going over all the in-water skills you would have learned in your original dive course. Whether you're newly qualified or have hundreds of dives logged, the Advanced course gives you the confidence, skills and experience to take your diving to new levels of excitement. What makes your pulse race? What ignites your imagination? Advanced Diver training offers something for everyone. 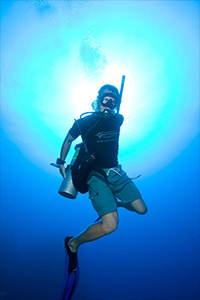 This in-water, performance based course includes two "core" dives: a deep and underwater navigation dive, and three different "elective" dives that may include: boat diving, underwater photography, computer diving, night diving, drift,and more. This course will take your maximum diving depth limit to 40mt allowing you to experience a whole new underwater world at the maximum recreational diving limit. Rescue training takes you beyond the purely recreational level by expanding your knowledge and skills to assist other divers, handle problems and emergencies, and prevent those problems, leaving you with a sense of security as a diver that cannot be obtained in any other way. Rescue certification is a prerequisite for all dive professional level training. The course makes the serious subject of accident management enjoyable and rewarding. Until now, the emphasis of your training has been you and your dive buddy; the rescue training teaches you to make diving more safe and enjoyable for others. There must be some area of diving that particularly interests you. Let us help you to develop your skills in this area and expand your knowledge. 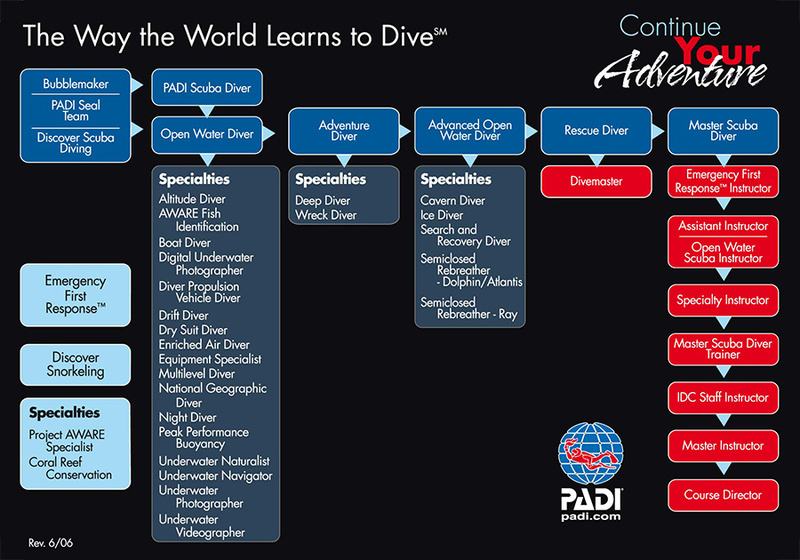 Our instructors now offer you the complete range of PADI specialties. Favorites include: Underwater Naturalist, Deep Diver, Wreck Diver and Night Diver. Specialties are available in conjunction with our beach dives or daytrips with the flexibility of been worked in to your diving schedule. If you've thought about making diving your life or maybe just reducing the cost of your vacations then becoming a Dive Master is the first step. At Cape Dive we treat our leadership level courses with the seriousness they deserve, while still maintaining the personal touch you just don't get elsewhere. You'll find that there's no more rewarding experience than following the Cape Dive staff through their work and becoming a part of our team. The course can be tailored to your individual needs and schedule, but remember, the more you put in, the more you will get out.